Design and Durability: A Winning Combination! These office stack chairs from OFM are ideal for conference rooms, waiting rooms, as office side chairs or for event seating. Customize the chair to fit your needs with the available accessories and color options. These stack chairs feature an easy clean, all weather seat and back, stable 300 lb. 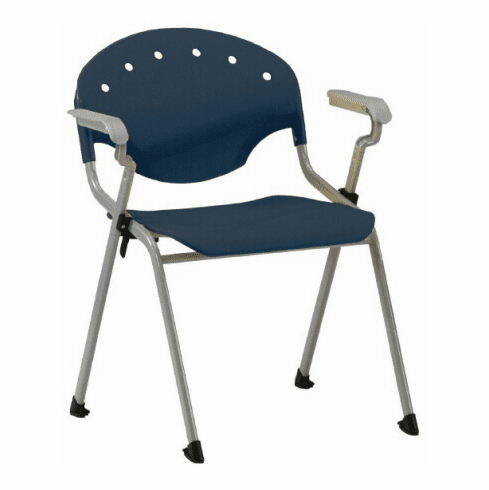 weight capacity, powder-coat painted steel frame in silver finish, are lightweight for easy mobility and stackable up to 15 chairs high. These chairs meet or exceed ANSI/BIFMA standards. Dimensions: Seat size: 18"W x 16.25"D. Back size: 20.25"W x 13"H. Overall height: 31". Limited lifetime warranty from OFM. These OFM stack chairs normally ship within 1-2 business days from our NC or AZ warehouse. Price listed here is per chair.